Hayes Valley Farm, Laguna between Fell and Oak St.
For several months now volunteers have been hard at work at transforming a vacant lot between Fell, Oak and Laguna into an urban farm. The vacant lot spans 2.5 acres and is a city-owned property liberated by the demolition of the Fell Street Freeway Off-Ramp when the Octavia Boulevard was conceived. The large plot was scheduled to be turned over to contractors and be converted into condos and residencies, but due to the economic downturn it has sat unused for years — until local activist groups decided to do something about it! There are a bevy of activities going on that you can take part in, including volunteer work days every Thursday and Friday. And now on July 20th there will be an outdoor movie screening of Botany of Desire – based on Michael Pollan’s acclaimed book. Gates open at 7:00pm with live bluegrass music by the Jugtown Pirates. 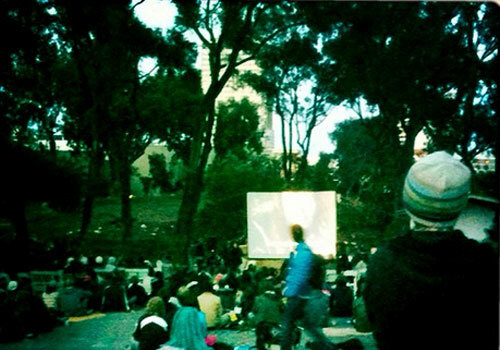 The film begins at sundown, approximately 8:30pm. It’s free and there will be a fresh bake sale and refreshments, trivia prizes, and a raffle! Bring your own blanket. Some chairs will be available on a first-come-first-serve basis. Rendered in:0.1062 seconds with 7 queries, using 252 k / 462 k.